There’s no denying that buying a new central heating boiler can prove to be very expensive – especially if it’s a purchase you hadn’t bargained for! Whether you’re looking for a new boiler that’s more efficient and economical to run, or a replacement for a boiler that’s broken down, as a company with many years of experience of boiler installations in Ben Rhydding, we can offer the benefits of our expertise and impartial, no-strings advice to help you find the best boiler to suit your requirements. There are a number of different types of boiler available and the best boiler for you will depend on the size of your home and the kind of lifestyle that you and your family lead. Combi boilers are the best-selling boilers in the UK: taking up very little space, a combi boiler will heat your water and radiators efficiently. However combi boilers are most suitable for smaller homes where there is very limited roof space. System boilers are very similar to conventional boilers but without a feed or expansion system, enabling them to warm up a central heating system quickly. If your home has low water pressure and more than one bathroom, you’ll find that a system boiler offers the most economical option. We are a long-established company with many years of experience of boiler installations in Ben Rhydding and we’re happy to provide advice and information on the most suitable boiler for your property. When you’ve found the ideal boiler for your home, you’ll find that we offer a range of boiler installation and central heating packages. We’ve built an excellent reputation which is based on many years of offering exceptional customer service and professionalism. We promise to promise to not only find the best boiler to suit your budget, we’ll also provide a friendly yet professional service you can rely on. 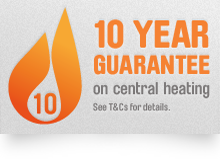 Our team of highly trained heating engineers have a wide range of experience and a wealth of up-to-the-minute product information, offering you the reassurance that your boiler installation is safe and in the best possible hands. Our expertise has been built up during many years of providing boiler installations in Ben Rhydding and we’re happy to offer a no-obligation quote or advice so why not contact us today? We’d love to hear from you!